Quinoa is an incredibly nutritious “grain-like seed” obtained from goosefoot family plant native to the highland plains of South-American Andes region. It is a pseudocereal rather than a true cereal, and therefore is not considered chametz. Quinoa is one of the gluten-free staple foods. Quinoa is rich with protein and dietary fiber. Quinoa is an excellent source of minerals like iron, copper, calcium, potassium, manganese, and magnesium. Quinoa – Pour 1 Tbsp of olive oil in the cooking pot and let it warm up for a few seconds. Slowly add quinoa, mix with oil. Add cold water. After it starts boiling add 1/4 tsp of sea salt, reduce the flame, cover and cook for 20 minutes. Veggies – While quinoa is cooking, cut the vegetables. 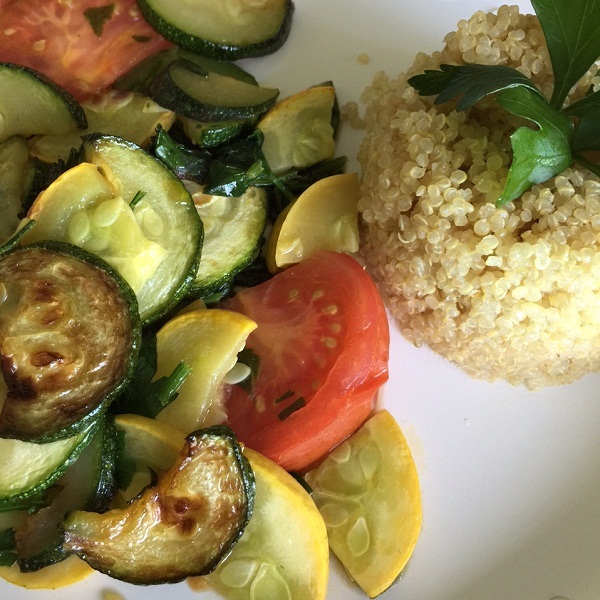 Pur 2 Tbsp olive oil on the frying pan, warm it up, add zucchini, yellow squash and tomato. Add 1/4 tsp of sea salt and a little bit of water. Saute for 5 minutes on a medium flame. Add parsley, cover and turn the flame off. It is good to serve in 1 minute. Health Tip ** Fiber helps prevent constipation by speeding up food movement through the gut. In fact, gastrointestinal transit time of food is greatly decreased. Fiber also binds to toxins, aid in their excretion from the gut, and therefore, helps protect colon from cancers. In addition, dietary fibers bind to bile salts (produced from cholesterol) and decrease their re-absorption in the colon, thus help lower serum LDL cholesterol levels.